Macromedia Flash content can include moving banners, advertisements or even mini-applications and games embedded into your website. If you have an idea for Flash content that you want in your site, contact SportsTG and we can explain how you can make this a reality. 1. Once you have the completed .swf file, click List on the left menu and then click the title of the page where you want to add the Flash content. Click ‘Create new record. 3. Enter the details of the Flash Movie. 5. Click Page in the left menu, then click the name of the page where you just added the Flash Movie. Click ‘Create New Record’ in the location where you want the Flash content to show. 6. 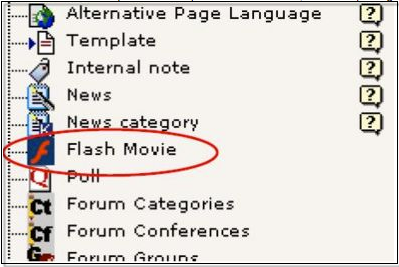 Select ‘Flash movie’ (under the heading Plugins). 8. In the popup window, click the name of the current page, then select the record you created in steps 1-4.